The ways in which artists repurpose debris always gets my attention. I work with trashed objects myself which affords me a more intimate, first hand understanding of the satisfaction in finding 'the good stuff,' then figuring out a compelling, aesthetic and sound way of assembling these resurrected materials to create something fresh. Julie Schenkelberg is one of this procedure's top practitioners. I find her current exhibition Hearsay at Asya Geisberg Gallery to be both challenging and enlightening as she pushes our sense of, for lack of a better term, visual comfort to near the breaking point where we realize the beauty in her vision. Hearsay, 2013, Dining room table, staircase spindles, exterior doors, newel post, bureau parts, church bench, cabinet doors, end table, cast furniture remnants, vintage 1940's glass lens, resin, wool, window frames, concrete, wire cattle fencing, and black velvet, 89" x 58" x 92"
Like Kurt Schwitters before her, Schenkelberg breathes life into the lost and forgotten. And as Schwitters once did most amazingly with his three incredible Merzbau constructions, Schenkelberg offers with this exhibition's central work Hearsay, a free-standing structure that we can enter, albeit only visually, and feel completely engulfed by her creative thought process. Also with Hearsay, there comes to mind an even more elevated reverence for the debris collected, as if the artist is building a place to perform rituals or some other type of formal procedure. 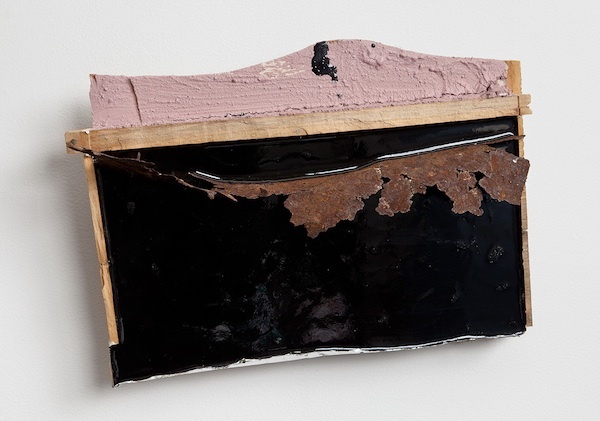 Vanity, 2013, Concrete, resin, rusted roof, and wooden drawer, 8" x 15" x 3"
With Schenkelberg's smaller works, it's more about developing a new language whereby shape, texture, color and most importantly reference forms complete thoughts. 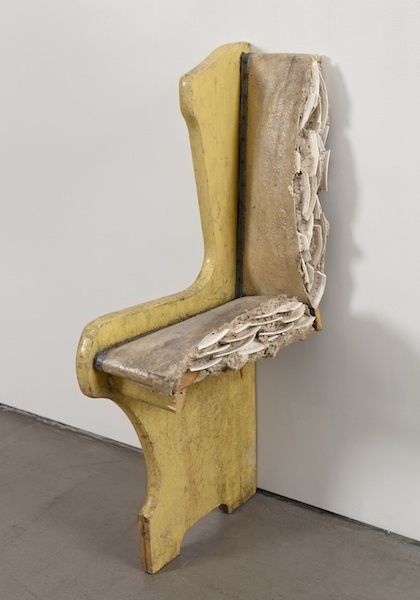 Vanity (2013), which combines concrete, resin, rusted metal and an old wooden drawer is in particular a most whimsical and poetic piece - the movement achieved here is quite beautiful. 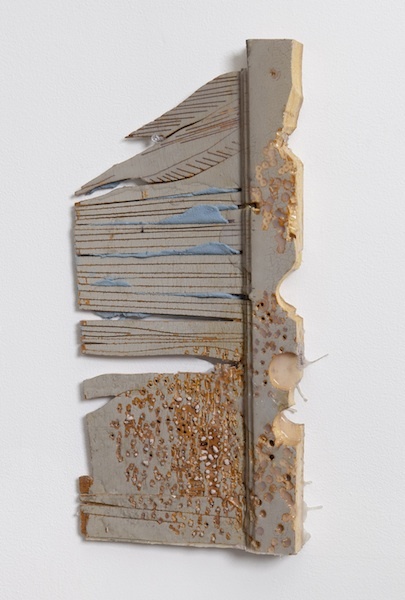 Other works like Calamity Divided(2013), which is comprised of a wooden vintage door, silicone, acrylic and concrete, or Divided (2013), made up of a wood sideboard top, paint, resin, concrete and a newel post both reveal a sensibility that relies more on conflict and intrusion than fluidity or finesse - yet, both works manage enough appeal to pull you right in and investigate the hows and reason the whys. Calamity Divided, 2013, Wooden vintage door, silicone, acrylic, and concrete, 19" x 12"
The one piece that really gets to me is Dowry Rediscovered (2012). 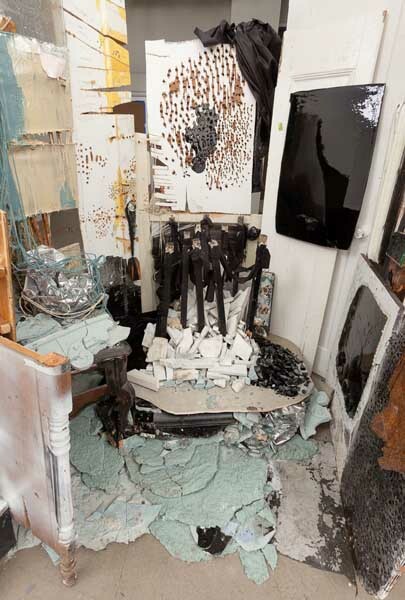 Here, one end of a wooden bench is filled, in its padded seat and back, with shards of broken dishes. Looking at this work, I can't help but be reminded of the way things once were, and in some instances still are, where peoples and cultures are oppressed to the point of hiding in attics or basements behind false floors or ceilings. 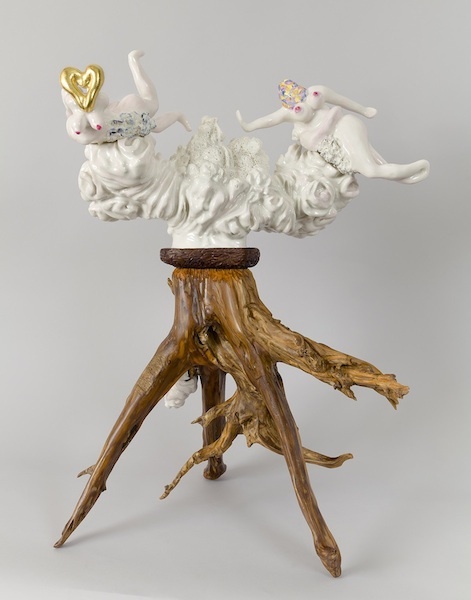 Dowry Rediscovered, 2012, Wooden bench, dishes, and resin, 26" x 14" x 6"
As you can see, Schenkelberg offers an entire array of emotions in her work - and in this age of virtual realities and social media, where one might need a little emotional tune-up - you should stop by and experience Hearsay. You have until April 20th. While there, take a look in the back room office gallery where you will find a selection of the porcelain sculptures of Annie Attridge. They're equally brilliant in a more sexual and dreamlike way.